The races in Dingle are the biggest of all Horse & Pony races in Ireland. The real racing fan cannot miss the twenty races that are spread over the weekend. The local saying that the summer is gone after the races might not be completely true, but what is true is that the races are the absolute highlight on Dingle's event calendar! More than 160 horses from all over the country will compete in these races for prices as high as €6,000. The centre of the racecourse is filled with bouncing castles, fortune-tellers and fair stands that sell everything from bouncing balls to saddler's sponges. Entertainment for the whole family! As the year slowly turns it's way to the month of August the tourist season is normally in full swing with people from all over the world coming to visit this magical and beautiful place of serenity and peace which Dingle town of high renown. However, on the second week-end each year the legendary and hollowed turf at Ballintaggart, with its famous Beenbawn turn plays host to the three days Dingle horse racing festival. It is the largest horse and pony race meeting in the country, its only three day racing festival with significant prize money, a superb setting and with over twenty one races (excluding divides) it's billing as the Cheltenham of this racing game is well merited. 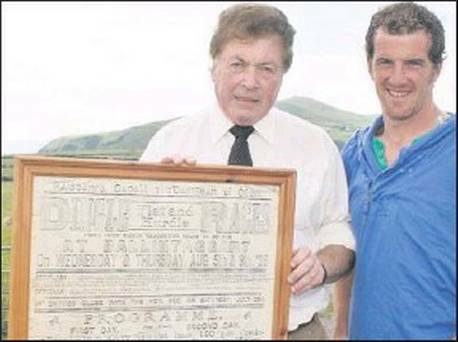 The most coveted prize in the country in this racing sphere is the Dawn Milk Dingle Derby over the extended two miles of the track which is run on ladies day on the Sunday. The continued tradition of this race meeting is a testament to the dedicated commitment and hard work of the Race Committee's down the years as each has added something new and then passing the baton on to the next generation ensuring the continuance of something which means so much to people locally. There are many links in the golden chain that make up and these include the Sponsors, Committee Members, Doctors, Ambulance Crews, Gardai, Vets, and horse owners who travel from far and near to be there each year. The continued support of the land owner Donal Moran in allowing the meeting to be run at this historic location is greatly appreciated by the race committee. While the racing programme is very important the added social and economic benefits to the town cannot be understated. Many local people plan their annual holidays around the races and meet up with family and friends and enjoy a very important part of their heritage being the races at Dingle. Indeed it is now accepted as being a very important event to the various business interests in the town. This is reflected by the very generous support given by these people to the race committee as without this funding it would not be possible to undertake this spectacular event each and every year. The races themselves are a huge local, national and international media event and the positive coverage from all these sources continues to further enhance the reputation of these races to new audiences and also helps to further promote the town in a very positive way. Horse and pony racing in this country has been a foundation stone of experience in for many of jockeys currently doing so well both here and in England. Many of these had their Dingle winners secured before going from outside to inside the rails to further enhance their careers. The names are endless but some which come to mind are Richard Hughes, Graeme Gibbons, Oisin Murphy, Conor King, Nina Carberry, Aidan Coleman, Adrain Maguire, Norma Williamson, Billy Lee, Gary Carroll, Martin Harley, Jack Doyle, Noel Fehily, Philip Enright, Pat Smullen, Rona Whelan, Wayne Lordan, Chris Hayes, Shane Foley, Bryan Cooper, Barry Geraghty, Philip Fenton, Emmett Mac Namara, Tom Queally and Colin Keane. The racing itself is run on a right handed seven furlong grass circuit with a brilliant view from the stand on this magical setting is a joy to behold. From the Derby trial stake on Friday evening to the Golden Mile on Saturday and the ding-a ling-ling time in the Dingle Derby on Sunday, the various pony derbies and other races has something for everyone who follows the horses. Winners in Dingle are treated with as much joy as those at any of the major races tracks all over the world. There are also numerous side shows on the day for those not totally interested in horse racing as well. For many of the people who continually follow these races Dingle races is their annual pilgrimage like that of those climbing Croagh Patrick. Each year people from Scotland, Wales and England make return journeys some with entries which adds an international flavour to the meeting. It is where there are winners and losers, the ones that did and did not shine, for some the dreams came through while for others they went out like a candle in the wind. In all cases hope springs eternal and a new year and again the counting down of the days until August when a field a mile from Dingle Town, converted to a splendid race course will see cheers and tears as the curtain call is raised on Friday evening with the opener and closed on Sunday evening with the finale. One often reflects how a small town continues to put on the greatest show on earth but whatever ingredients are there long may they prosper. 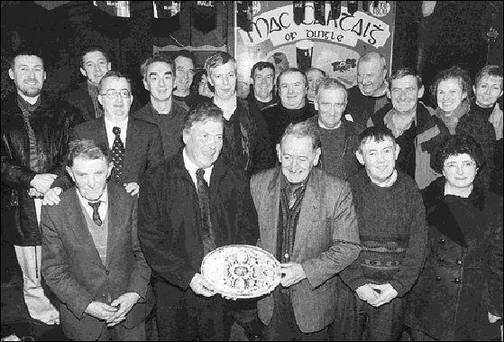 So after the great gathering of 2014 there let everyone have another re-gathering at the Dingle Races of 2016 which will take place in August 2016. Bí linn mar sin do Raiseanna Daingean Uí Chúis 2016.